2, Female and male thread connector is fixed on the hose by twisted with wrench firmly. 4, Hose specification is 8.5MM outer diameter and 11.3MM inner diameter.Working pressure is about 6bar,the brust pressure is 18bar. 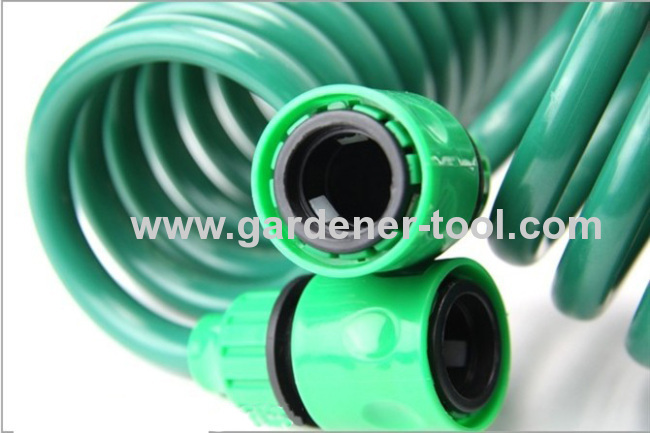 Garden Coil Hose as spring.When stock,it is as spring,small volume and saving room.When use,people can pull it out to longer,irrigate anywhere even if the plant is far away from outdoor tap. After use,garden coil hosecan automatic self-coil back gently,no worry it will damage plant or child. The female and male thread connector have standard and sharp teeth,it can joint outdoor tap and hose nozzle firmly,no worry about ungear when work. 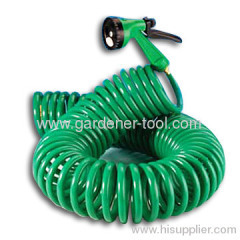 The brass connector is fixed to the garden coil hose by twisted with wrench by experience worker strongly.It can bear up to 18bar work pressure. 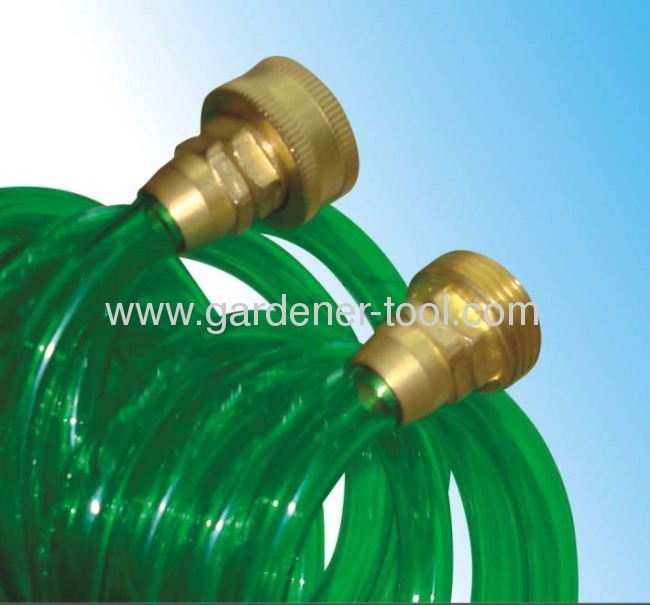 The brass connector on the garden coil hose can be instead of plastic quick connector for different customer.In general,European customer would like plastic quick connector for garden coil hose,American customer would like brass hose connector. 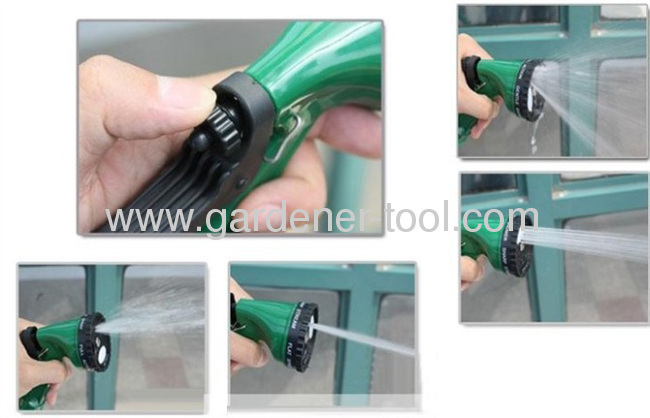 The 4-pattern water spray nozzle have 4 water pattern as Jet,Cone,Flat and Shower.It can used to car washing,plant irrigation,garden water,floor clearing,windows washing,pet washing and more. By tight or loose the plastic trigger,people can adjust the water flux for different water flux need. The stainless steel clip under the trigger can keep the trigger from the body,the water can be sprayed continualy without fatigue for saving labour. Color box with window package for garden coil hose.It is ideal package for showing in the supermarket,retail and Exclusive Shop. The color box is 3-layer 4 color box.In general,the color box is neutral color box without any company information,company logo.If want to print company information,company logo or another information on the color box,please send us artwork with design in 4 color. Color box without window package is option in our company.Compare to above package,this package is only without window,another is same,and the package cost will be cheaper very much. too. Q:What quantity limited in your company for one order? A :MOQ is 1000pcs.If less,please check us firstly. Q:What is delivery time in our company after order? Q:How we transfer money to your or what payment do you accept? A:Payment is TT or LC at sight.Another payment can be accepted if safe. Q:Can we order our customized color for product? 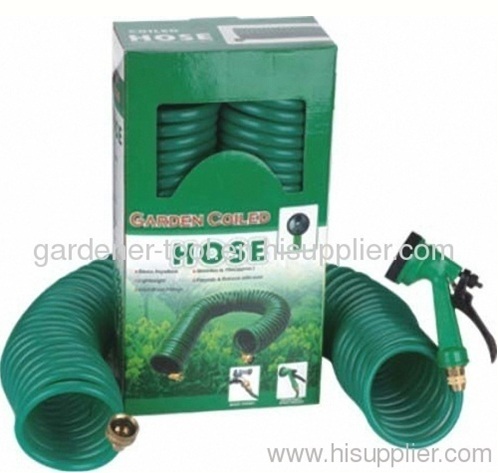 Q:We do not like this 15 meter garden coil hose,we want another length.Can you produce another length of this hose? Q:We are famous company with our brand,we want to use our customized color box with our logo.is it ok? A:Customized color box is welcome with design in PDF,AI,CDR form. Q:We wand to use another package,as double blister with color card,or email box for package.is it ok? Q:Besides 3/8",can you produce another specification coil hose?as 1/2"
A:Customized specification of hose is welcome with detail data.